Concurrently on view in the Thinkspace project room is AmeriCan’t, featuring new works by Brazilian born and Los Angeles-based artist Alvaro Naddeo. 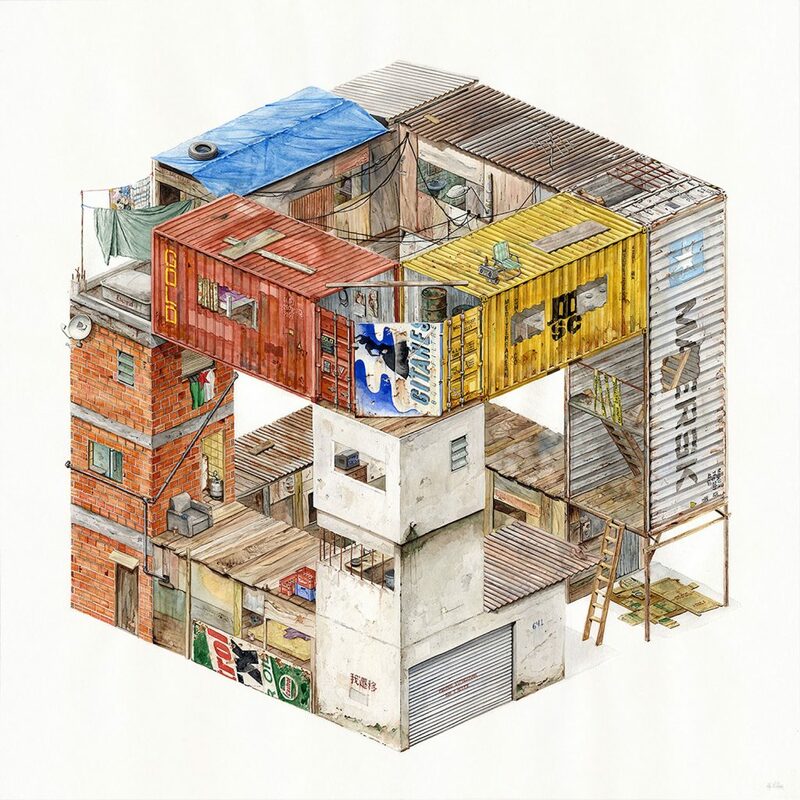 Interested in the study of castaway objects and the subtle graphic nuances of urban detritus gleaned from the city sphere, the artist combines its textures and edges in compositional amalgams. 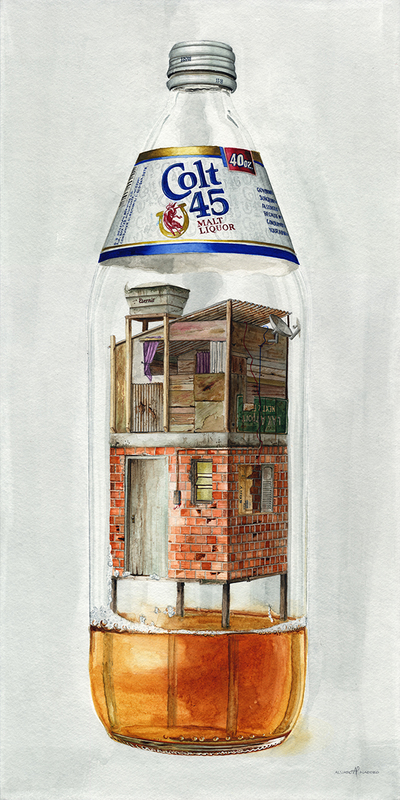 His interest in the life of the unassuming object extends to billboards and signage, cast away containers and boxes, and domestic and industrial spaces, conjoined and superimposed in unexpected mashups, or cultural relics that speak of use and disposal in the contemporary city. 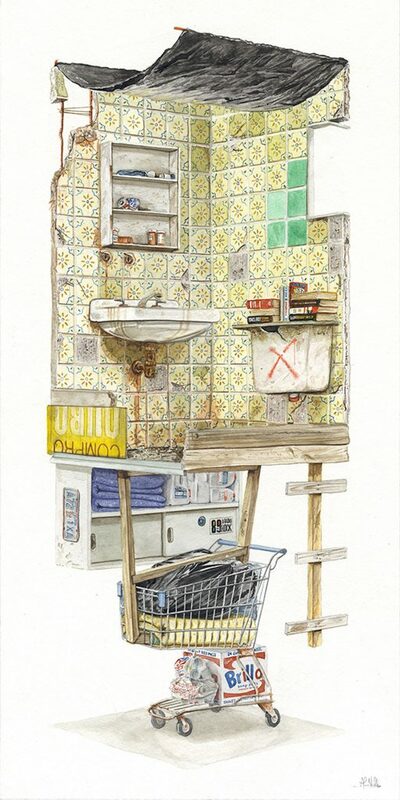 Working primarily in watercolor on paper, Naddeo achieves an impressive level of hyperrealistic rendering, bestowing unexpected poetry to the lowly remnants of the city’s waste and urban recesses. Naddeo’s works offer a commentary on the excessive momentums of contemporary consumerism, while his imagery explores the decay and deterioration of the city-worn. 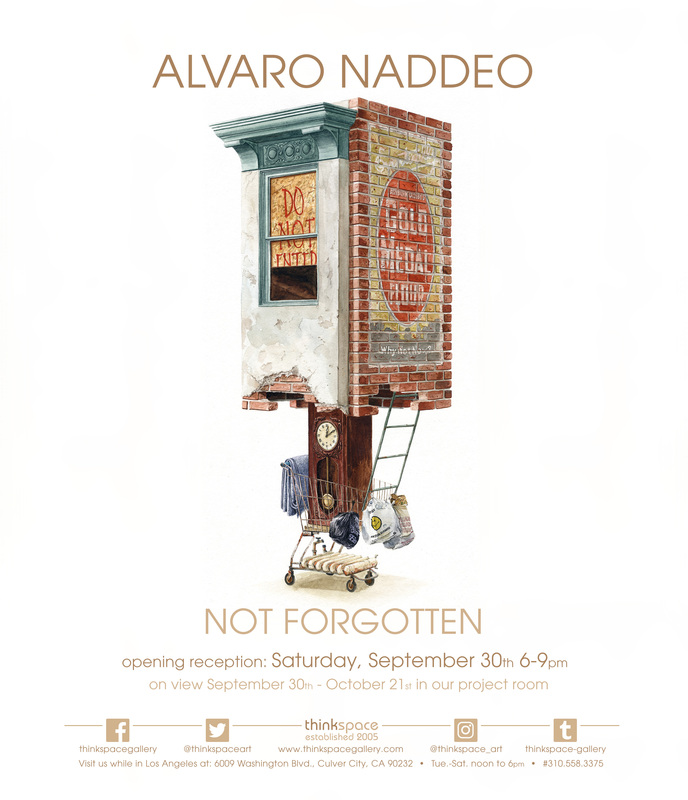 Thinkspace is proud to present Not Forgotten from Alvaro Naddeo in the Project Room opening September 30th. This is Naddeo’s first solo exhibition with the gallery, only months after exhibiting a few works in the Thinkspace Gallery office. A rotating area of the gallery featuring works from new artists to the Thinkspace fold, or returning pieces from group exhibitions across the globe. 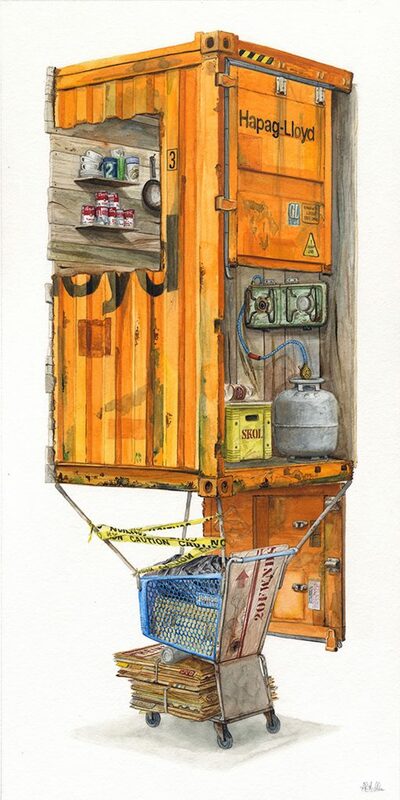 Naddeo is a self-taught painter whose works explore various urban environments and the objects found in them that have shaped his memory and imagination. 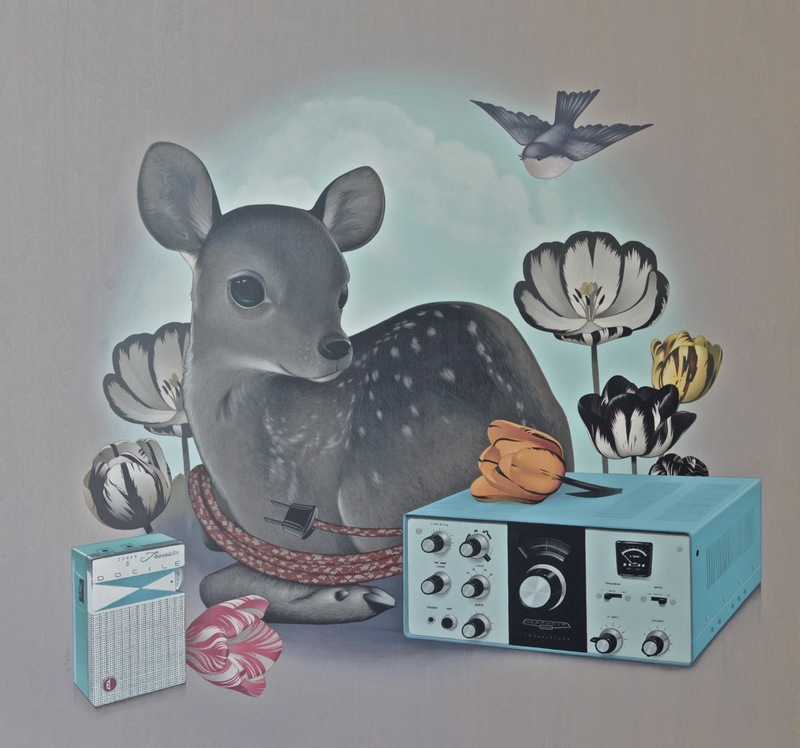 Autobiographical in nature, the compositions contain symbolic references to his own nomadic past and his transition through the landscapes of several different cities and countries. We interviewed Alvaro Naddeo for “Discarded” back in March where we deep dived into his creative process, today we explore more of the artist. SH: You recently showed in our office space in March, and now a solo in the project room, what can we expect from this new body of work? AN: This new body of work is, in my opinion, an extension and an evolution of what Thinkspace showed at the office space earlier this year. The theme, tone, voice, and medium are the same, but the ideas got pushed further and the exploration was broader. I like this new series a lot more than the previous one (which I like too!). I believe the composition of these paintings is cleaner and the concepts are clearer. I’m very happy with this body of work. SH: What do you think is the role of the artist in society? AN: I believe the role of the artist in society is to provoke, question, raise concerns and share thoughts about the society we live in. Most artists are very good at making observations on what’s going on in the world, pass those observations through a personal filter, and then put them back out there by sharing them with society. All of that while celebrating aesthetics. SH: How do you approach each piece in a new way that challenges you as an artist, and motivates you to push your artistic voice? AN: Each piece is more challenging than the previous ones because I’m looking for new ways to express a similar thought. I always want the recent pieces to look better and fresher than the previous ones, so that’s another challenge. My motivation comes from the desire to express myself. I’m a shy person but I do have an opinion and I like to share it with others and since I don’t do it much verbally, I feel motivated to do it through painting. I’m also motivated by the connection that is formed with people who like what I paint. I feel that the group of people that my paintings connect with are really interesting. It seems that they are a very small fraction of the general public, but they are very engaged and intense. SH: What plays in the background while you’re working on a composition? AN: I listen to a lot of podcasts from Brazil and the US. Sometimes a little music plays, but mostly podcasts. AN: I would love to collaborate with Pixar. I hope John Lasseter has a google alert for every time his name appears somewhere and he receives this interview and checks out my art! AN: The improvement I’ve experienced in the last 5 years as an artist is huge, not necessarily because of where I am now, but mostly because of where I was then. I don’t show almost anyone what I was doing 5 years ago. It was clearly necessary to go through that and to paint those pieces to get where I am now. That’s normal. That’s the journey of most self-taught artists. It takes a while to figure out many things. There is so much to learn in terms of technique, composition, color use, scale, etc. In the next 5 years, I wish to grow, even more, improving my technique, learning to draw better, and also to be able to paint more hours than I do now. SH: If you had a dinner party, who would be the guest of honor? What would be the menu? And what is the one question you’d ask all your guests? AN: I would have three guests of honor: Kurt Vonnegut, Julio Cortázar, and Stanley Kubrick. Dinner would be whatever they like and sushi for me. The question would be: How would you like to improve as a person? SH: Answer the question you would ask all your guests. AN: I want to be able to always and constantly desire less of everything and to continue being grateful for everything good that happens to me. Join us for the opening reception of Not Forgotten on September 30th from 6 to 9pm. Concurrently on view in the project room is Not Forgotten, featuring new works by Los Angeles-based Alvaro Naddeo. 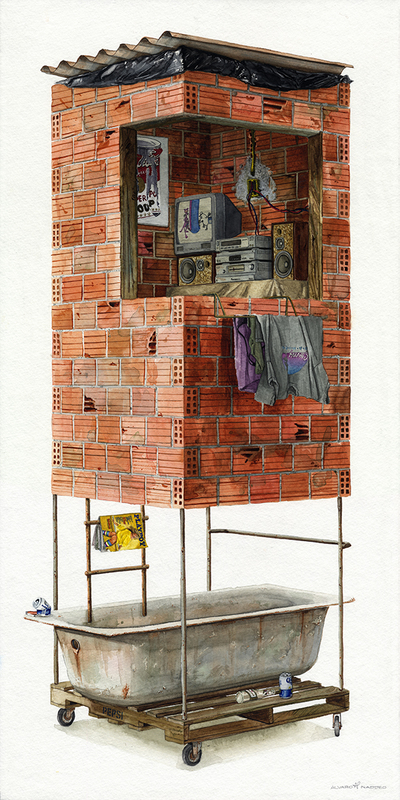 Originally from São Paulo, Brazil, Naddeo is a self-taught painter whose work explores all manner of objects drawn from the various urban environments that have shaped his memory and imagination. Autobiographical in nature, the work contains symbolic references to his own nomadic past and his transitions through the landscapes of several different cities and countries. 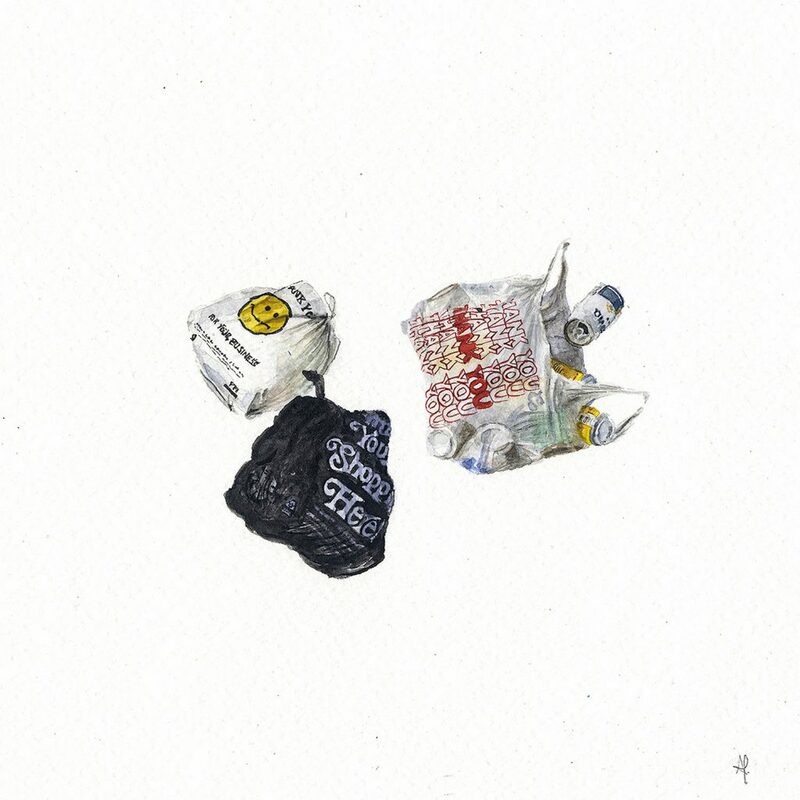 Much of Naddeo’s work focuses on his societal concern over rampant consumption and waste, as well annexation and poverty, depicting accumulations of objects and detritus drawn from the city. Not Forgotten is Naddeo’s first solo exhibition with the gallery. A 20-year veteran in advertising and art direction, Naddeo has reapplied himself to the creation of his own work after a substantial hiatus. 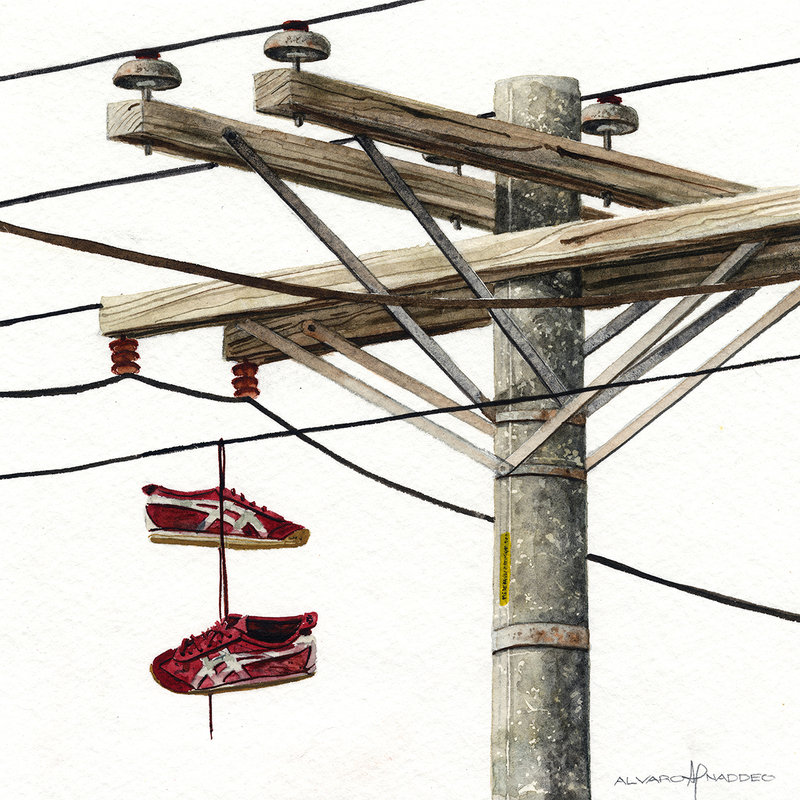 Creating primarily with watercolor on paper, the level of detail he can convey captures the humanity of these inanimate urban remnants with true soul, tinged with a subtle feeling of melancholy and loss. 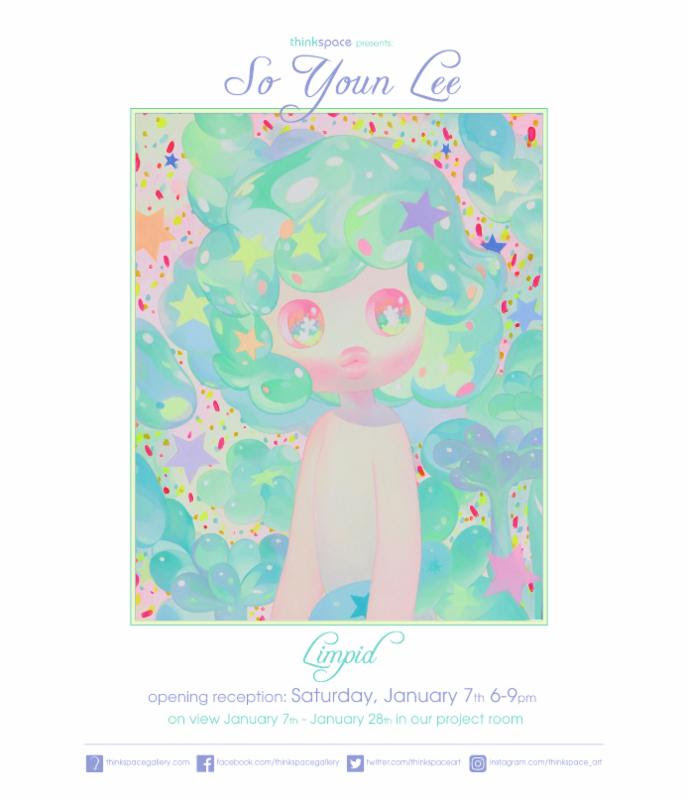 Thinkspace is proud to present So Youn Lee’s newest body of work ‘Limpid’ in our project room this Saturday, January 7th. 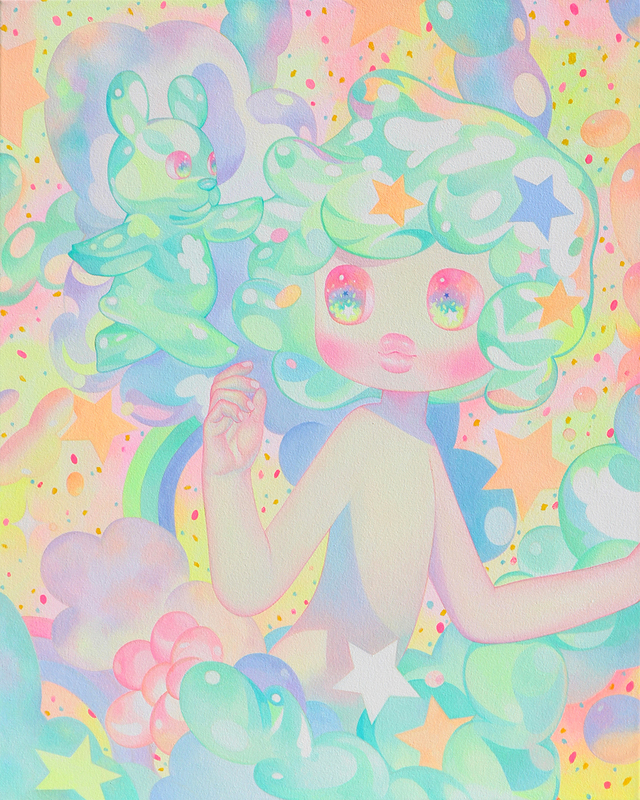 The San Francisco-based artist creates a pastel-colored filled world of whimsy as her character Mango explores Lee’s analys of emotions. 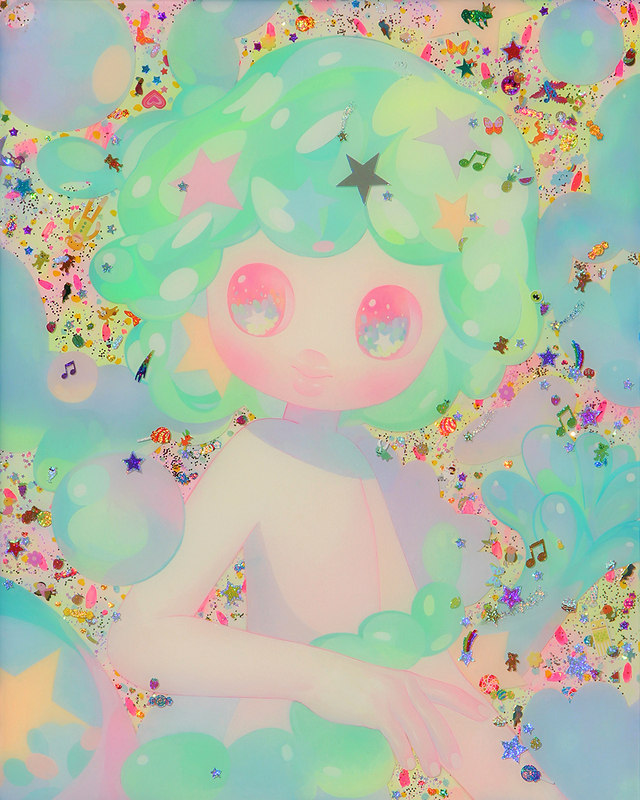 In anticipation of her upcoming exhibition with us, we have an exclusive interview with So Youn Lee to discuss her inspiration, Mango’s fruition to being, a day in the studio, and so much more. Join us at the opening of ‘Limpid’ Saturday, January 7th from 6 to 9 pm. SYL: Limpid is a body of work inspired by the concept of nostalgia. I was visualizing the emotional perceptions of nostalgia in my paintings. 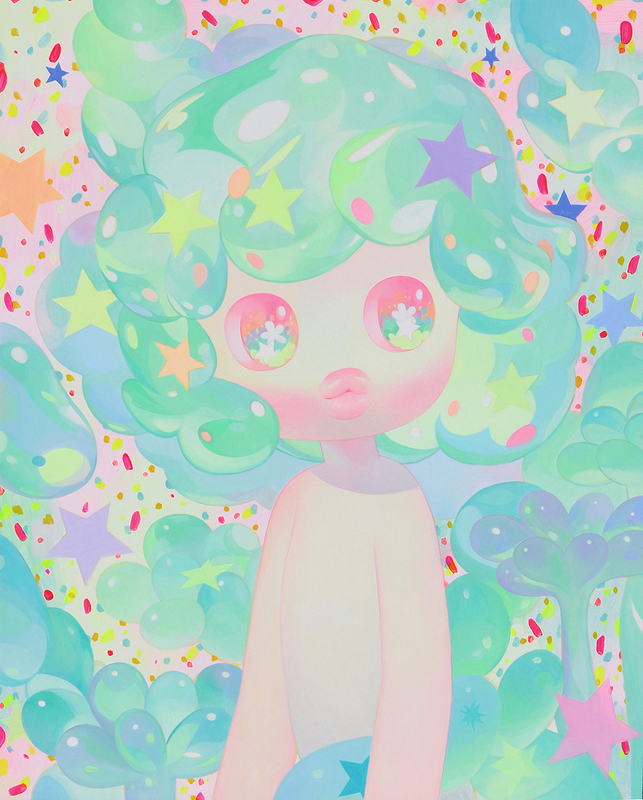 It molds certain moods for the character and color scheme for this body of work. 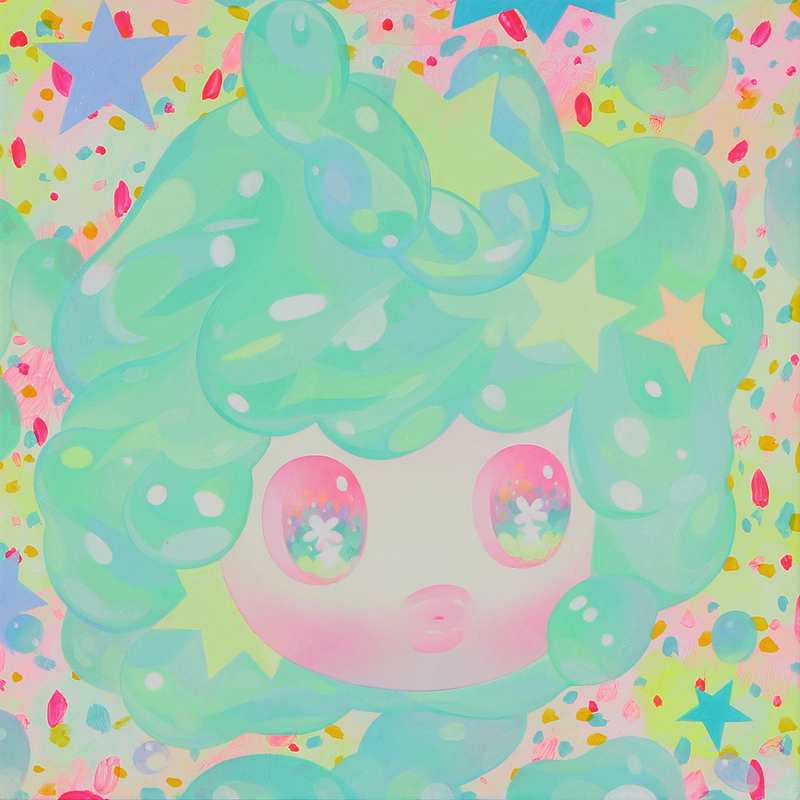 Light green and soft-gelatin like clear textures which reminds me of whimsical time in youth. SH: Can you explain who Mango is and how Mango came to be? SYL: Mango is a fruit as you know, and I call my characters ‘Mango’ in my colored works. I got inspired by its color, texture, and taste. When I first started to draw my new character, it looked so weird to me but senselessly cute. It reminds me of my very first encounter with the taste and textures of a Mango. The texture was so foreign but so delicious at the same time. SYL: I have my regular studio time after breakfast Monday to Friday. I go out for inspiration hunting and relax on the weekends. If I have to create new work, I start from sketches on scratch paper to transfer a composition according to the images that I already have in my mind when I think of the concept or subject. It’s like I excavate visual responses from my mind about the subject on a drawing/ painting surface in physical world. When the sketch is done, I transfer it on a painting surface that I love to use whether canvas or panel. SH: People have described your work as innocent, how do you feel about that description? What does innocence mean to you? SYL: I consider it as compliment, when I think of the term ‘innocent’ it feels like there’s pure potential to be or to do anything we like to do. So if my work evokes those feelings to the audience, I am happy and I’m glad it gives a positive image and feeling to the audience that sees it. SH: What is your favorite childhood memory? What aspects of childhood do you think help us to navigate the adult world? SYL: I use to love spending time in nature by myself as a child, imagining many beautiful and weird things. Those imaginations helped me to become a person to work in a creative field. The freedom that we have had to explore things in our own ways in childhood could influence and mold us as an adult. SH: How has your artistic style developed over the years? SYL: I was lucky to have had many shows the past three years, I’ve learned more things about my own desires as an artist. It has affected me to try different mediums and approaches in my paintings. SYL: Reading, playing with Choco and relaxing when I have a chance. SH: What do the helmets represent in your work? SYL: In this show, I don’t have any artwork with a helmet. I paint helmets when figures from two different worlds meet in one space in my paintings. The helmet is a symbol of being open-minded to understand someone or something beyond prejudice and perception or see things from a different perspective. SH: What excites you about another artist’s work? What makes you a fan and can you share a few people we should look up? SYL: I admire artists who have very distinctive visions and evoke strong emotional presence in their works. There are so many, and most of them, you must know them already. My all time favorite is Yoshitomo Nara. SYL: It really depends on the size and medium. Yes, I have a tendency to work on multiple pieces at a time. SYL: I will continue to do my best to improve myself as an artist and travel more. 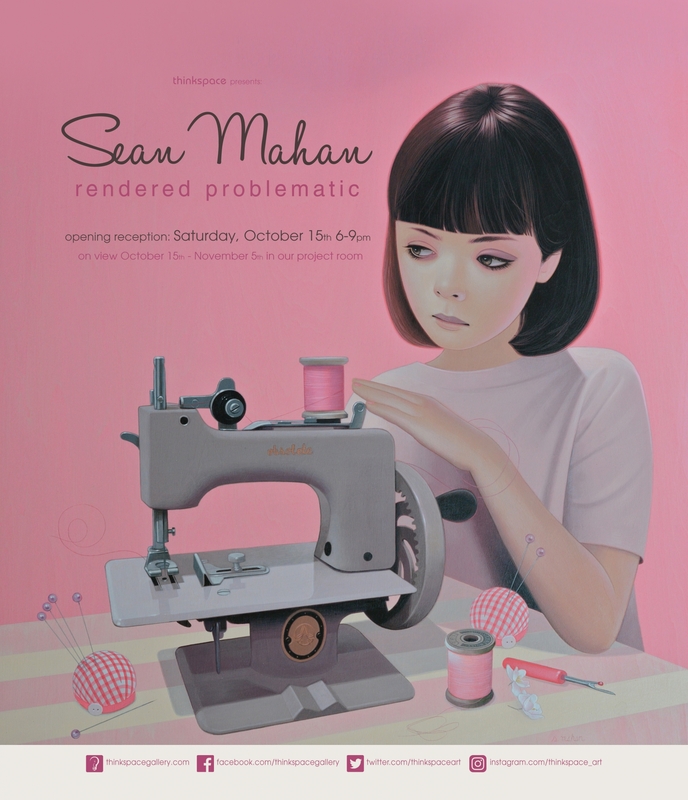 Concurrently on view in the Thinkspace project room is Rendered Problematic, featuring new works by Sean Mahan. A mixed media painter from Florida, Mahan creates soft and subtle figurative works in graphite and acrylic washes on wood panel. 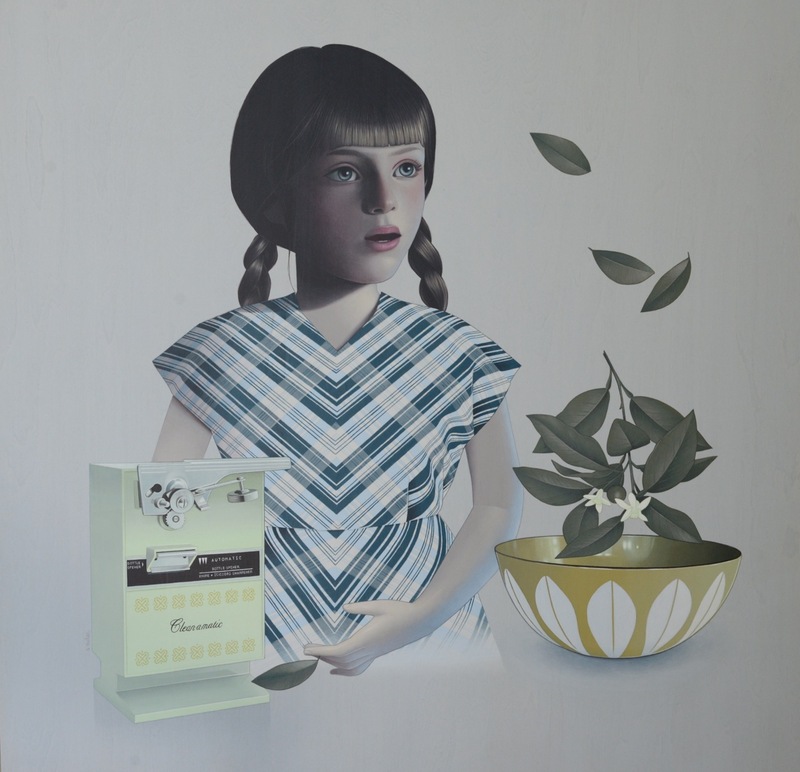 A cultivated nostalgia persists in his paintings, as shadowy images of picturesque and serene children in light pastel and vintage palettes handle records, dated appliances, and classic sewing machines. The wood grain is preserved with a quality of transparency throughout, adding a dimension of warmth and organic variance to the works. 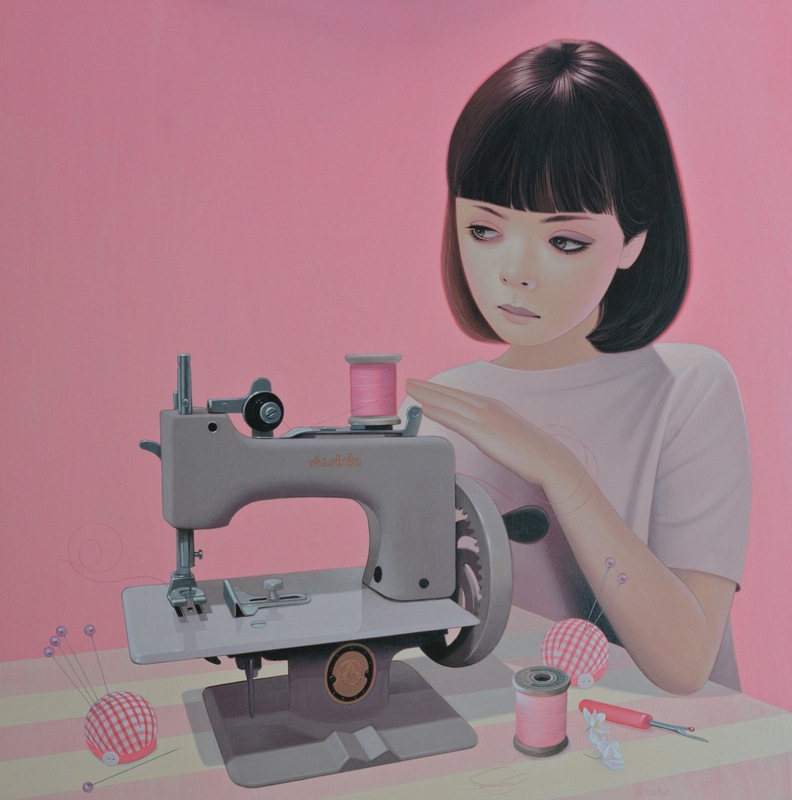 Mahan’s aesthetic conveys a human innocence and captures a strange sweetness, creating a feeling of quietude. His portraits convey an ambiguity of time and place; it’s a world of analog hand making and pre-digital youth, one of childhood simplicity unmarred by adult disillusionment. The consumption, impermanence, and disposable quality of modern culture is far from these idyllic scenes of contemplative pause. The object figures prominently as both an implement and subject in his imagery, suggesting its primary role in the formation of identity. His works celebrate the outdated and obsolete by representing older technologies, objects, and cultural ideals in an attempt to interrupt the alienating, and dominant, momentums of discard and overuse. Despite this seemingly idyllic staging in each piece, its stylized omissions point to a more complex set of issues. Mahan is interested in the formation of identity in normative culture, and the reductive imperatives that circumscribe it. Absent are any indications of that prescriptive outside world in his works. The subjects themselves are independent, suspended in an immaterial environment and displaced within the panel in the absence of defined physical space. This spatial ambiguity and sparsity contribute to a feeling of melancholy throughout, as though the images themselves offer an impossible beauty.